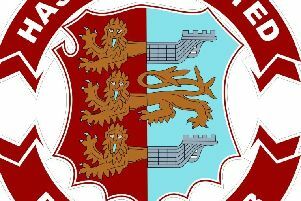 Hastings United Football Club could face Brighton & Hove Albion in round three of the Sussex Senior Challenge Cup next month. Yesterday evening’s (Saturday’s) draw handed Bostik League South East Division high-flyers Hastings a home tie against the Seagulls’ under-23 development squad or Bostik League Premier Division outfit Lewes. Little Common, meanwhile, also received a home draw, against Haywards Heath Town, who stunned Crawley Town in round two on Tuesday. Common play in the Southern Combination League Premier Division, while Heath ply their trade one level higher in the Bostik League South East Division. The ties are to be played on or before Wednesday December 5. Hastings came from 2-0 down to win 4-2 away to Saltdean United in round two and Common pulled off a splendid 3-1 victory away to Horsham YMCA. Full draw: Little Common v Haywards Heath Town; Hastings United v Brighton & Hove Albion or Lewes; East Grinstead Town v AFC Varndeanians; Pagham v Burgess Hill Town; East Preston v Chichester City; Bognor Regis Town v Three Bridges; Horsham v Eastbourne Borough; Eastbourne Borough v Worthing. Hastings are away to Cray Wanderers in a first versus second league encounter today. Kick-off is 3pm.